“Too bad you always work on the weekends” I exclaimed assumingly, as we were mentioning that we did not hang out enough. You see, U, my kai jie (god-sister) works at days and times that are not the usual slaves of cubicle nations (like poor ol’ me), she could work from break of dawn or till the wee midnight, even on weekends and break on uncertain days of the week. It is nearly impossible to catch her, not to mention that she chose to stay quite far away, even in my context of after 7 years of staying in Klang Valley that requires quite a travelling distance to get to places (in Taiping context), which used to be where I stay in my days long gone. Ah, those were the days. “Oh, I am off on this Saturday!” U shouts with excitement (through MSN mind you, but I can feel the excitement all the way from her house to my office). “What!” that is all I can answer at the moment. It was a befuddlement to me. Then the moment passed and I got a grip on myself “We must hang out then! Catch up! What shall we do? Shopping? Eating? Watch a movie?” I babbled on and on like an excited kid that has been promised an all day outing. “I am afraid of spending too much if we go out, let’s just stay in”, she says, at that moment I flash back to the last time we hang out, we watch movie, shopped and ate indulgingly as if we are some rich tai-tais (wives)having a day out, I blushed. 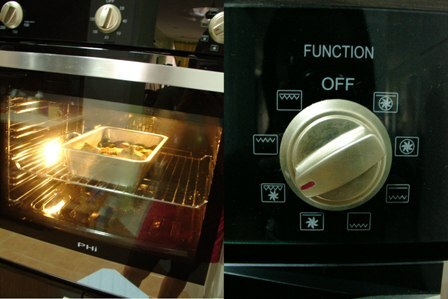 Then a light bulb flashed right above my head, while my eyes roll up where I imagined a picture in my mind – U and I baking delicious stuffs out of her huge, and I mean huge oven that I had ooohed and ahhhed over when I visited her place the first time. So I exclaimed “OK! Let’s stay in, we cook something and do some baking!”, and her resounding yes! had made my heart jumped with excitement. So that very Saturday, I went out to buy the necessary stuff that I can get at last minute (yes, that’s me again at it) and all my usual ka-changs, before heading off to her lovely home. 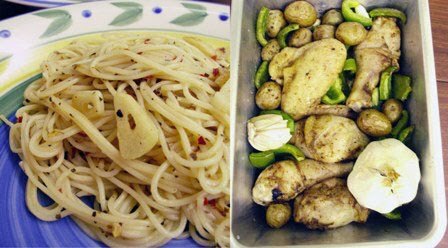 When I reached, U had already begun baking chicken with baby potatoes and capsicums and loads of garlic. The house is already basking in wonderful food aroma, ah, how I miss those smells which make a house feels like home. Then like some chef cooking at home in her day off, she whips up spaghetti aglio olio with such style and flamboyant, she made me feel like I am eating food from a posh restaurant when we finally dig into the food. At same time we watched a chick-flick that I normally would not be watching, but it is alright because I was too busy enjoying the food anyway. Finally when the show ended, and with me nearly falling asleep, she asked, “So what’s up for baking? “. When I told her I planned to make three bakes today, her eyes grew wide and I laughed, she just had to pardon me, who is someone that had been deprived of good baking therapy lately. Admittedly, I have not been baking much in recent times, so was a bit rusty on the baking instincts, and also due to ripping off recipes from my ever-long to-do list without thoroughly examining it, out of our three bakes, only one truly came out good. And luckily it was really good, I brought it the next day to work for breakfast, my sceptical colleague took a bite and say “hey, it’s good, just like those you can get in the famous-coffee-chain”. Ah, such things are what bakers or cooks out there would loved to hear, that the people who ate their food enjoys them as much as they do themselves, I did for mine! I called it banana bread-fin because, it was supposed to be banana bread but I made it into muffin sized because I had this bunch of muffin cups around and I want to take the shortcut in baking them. Muffins bake in nearly half the time than bread. Besides, the outcome is more muffin like, possibly due to some of my own modification of the recipes (I am always guilty of this, couldn’t help tinkering). Making it into muffin also gave me the chance to see U in action, where she shows how commercial bakers make muffins quickly, by scooping up the batter with their hand and squeeze into each cups, using their palms as ‘funnels’. We had such fun doing it, we forgot to properly swirl and level the top and coupled with us not putting the muffin cups in proper muffins trays, it resulted in whimsical muffins, where after a long good laugh, I find it quite adorable and it gave a homemade feel to them. Mix together flour, baking powder, baking soda, salt and cinnamon in a bowl. In a separate bowl, combine together eggs, banana, sugar, and oil. Add in the flour mixture and stir till just moistened (do not over-stir, batter should be lumpy). Fold in the chopped chocolates (and/or walnuts) gently. Makes about 12 muffin cups if squeezed properly!